When it comes to extreme metal, Cannibal Corpse unquestionably lead the pack. Their success and popularity is unparalleled in their genre, which is especially impressive considering the vicious and disgusting nature of their sound and artwork. Since their 1988 inception, the Florida-based (by way of Buffalo, NY) band have been pushing boundaries both musically and thematically, making them not only the best-selling death metal band ever, but also the most controversial. Cannibal Corpse combine an unrelentingly brutal approach to death metal with over-the-top, grotesque lyrics and imagery, which got them banned from various countries. In the band's earlier years, Germany outlawed the sale of their albums due to their graphic content, and later prohibited the band from performing songs from their first three records live in the country. In 1996, their albums were banned in Australia, and were only re-released there starting in 2006. Even as recently as 2014, several of the shows on their Russian tour were cancelled due to religious protests. Yet despite these bans, as well as the many lineup changes over the years (bassist Alex Webster and drummer Paul Mazurkiewicz are the only remaining original members), it's never stopped Cannibal Corpse from consistently releasing top-notch albums throughout their three-decade career. On November 3, the death metal legends are set to release their 14th studio album, Red Before Black, courtesy of Metal Blade. In its honour, we're taking a closer look at the band's prolific catalogue. Below, find Exclaim! 's Essential Guide to the masters of brutality, Cannibal Corpse. Kill marked a turning point in Cannibal Corpse's history. 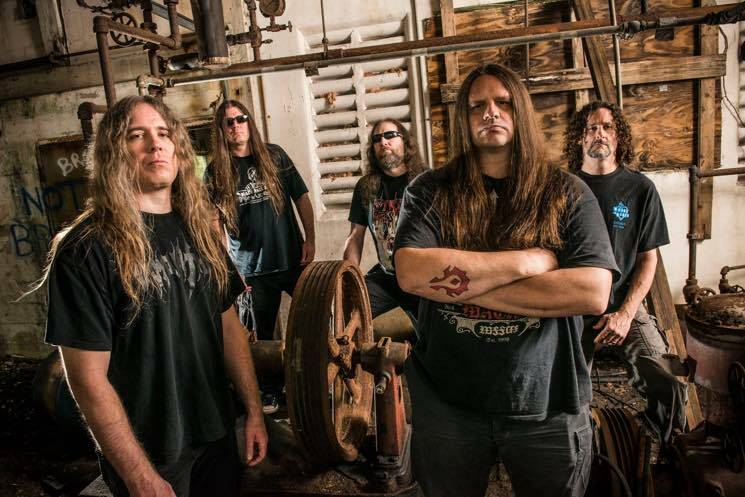 After releasing a series of arguably mediocre albums that lacked the vigour and intensity of their early efforts, the band were joined once again by guitarist Rob Barrett for his first record with Cannibal Corpse in ten years. Coupled with production by Hate Eternal's Erik Rutan, the results were remarkable. Kill features an old school vibe that their previous few releases lacked, while also exuding a raw, unforgiving aggression that hadn't been heard from the band since 1996's Vile. It also represented their most cohesive and focused record in years. Kill presented a new, reignited Cannibal Corpse. Released during a phase of Cannibal Corpse's rejuvenation, Torture epitomizes how to take the classic death metal style into modern times. The incredibly well-written record is an onslaught of bloodthirsty ferocity from start to finish, from hyper-speed bombardments like "Demented Aggression," to Mazurkiewicz's machine-gun drumming on "As Deep as the Knife Will Go," to the crushing grooves and impeccable leads of "Scourge of Iron." Torture captures everything fans know and love about Cannibal Corpse, and features powerful, crisp production to boot. Although Butchered at Birth is Cannibal Corpse's second album, it's the one that established their death metal sound. The record also solidified their status as controversy-starters, with overtly grotesque cover art as well as obscene song titles and lyrics that resulted in the release being banned in Germany. Musically, Butchered at Birth is a classic death metal record, slightly rough around the edges yet filled with thoughtful structures and intricate songwriting. It's with this album that vocalist Chris Barnes introduced his low, grunting gutturals, which became his signature style that would influence countless death metal vocalists to come. The first album to feature vocalist George "Corpsegrinder" Fisher following the dismissal of Barnes, Vile was met with some apprehension at first. However, all doubts were shredded as soon as that drawn-out, blood-curdling scream kicked in on opener "Devoured by Vermin." Vile finds Cannibal Corpse returning to a more brutal death metal approach following the groove-filled The Bleeding (1994). Corpsegrinder's vigorous, dynamic vocals complements their sound perfectly, while guitarist Barrett contributed some of the band's most intense riffs and complex structures on tracks like "Bloodlands" and "Absolute Hatred." It would be his last album with the band for a decade. There is a reason why The Bleeding is the best-selling Cannibal Corpse record to date. It's perfect, quintessential death metal; the band continued to refine their sound after their first few releases, resulting in an album that represented a benchmark not only for Cannibal Corpse, but for the entire death metal genre. The record is comprised of ten extremely hostile tracks with insanely gory and outrageous titles, which comprise over 35 minutes of intense, pulverizing aggression. The Bleeding is their last release to feature Barnes, and leans towards a more groove-based style with more decipherable vocals that Barnes would later introduce with Six Feet Under. The album also marks the first Cannibal Corpse release that was somehow legal to be sold in Germany, as the first three were deemed too offensive. If you're looking for the essence of Cannibal Corpse, start with The Bleeding. Cannibal Corpse's 1990 debut, Eaten Back to Life, is a much less extreme representation of what they would soon become. The album features more of a thrash approach, as their harsh death metal style hadn't yet fully developed. 1998's Gallery of Suicide marks their first album not recorded by Scott Burns, and the quality isn't up to par with their previous releases — not to mention that the songwriting is lacklustre, especially in comparison to its predecessor, Vile. 1999's Bloodthirst and 2004's The Wretched Spawn follow suit; they're arguably the band's most mediocre and unmemorable, which makes their surprising revival with return-to-form album, Kill, all the more welcome and appreciated. Sandwiched right in between Butchered at Birth and The Bleeding is 1992's Tomb of the Mutilated, Barnes-era Cannibal Corpse on the upswing. Here, the band are honing their brutal sound, upping the headbang-worthy riffage and employing better producers. It's the natural stepping stone release that culminated in legendary album The Bleeding. 2009's Evisceration Plague finds the band in the middle of their rejuvenated phase, and much like its predecessor, this one doesn't disappoint. Proving that Kill wasn't just a one-off, Evisceration Plague features a groove that evokes their early releases while incorporating some technical flair and the fast-paced severity that Cannibal Corpse have always been known for. Finally, 2014's A Skeletal Domain showcased an increasingly confident, more modern Cannibal Corpse. The band had mastered the art of maintaining their iconic sound while incorporating innovative twists that differentiated each new album from the last. This is another classic release, with fresh material that's just as merciless as their stuff from the '90s.